The cards were sent in 2007, 2008 and a couple from earlier this year. I guess the system is still slow, but effective and as long as you are not in a rush the Bureau, works just fine. 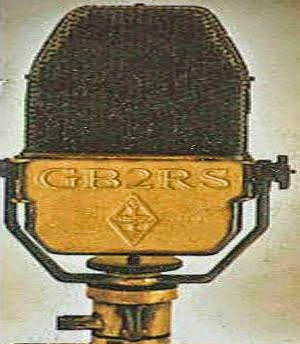 Most weekends I try to catch the Sunday morning local GB2RS News broadcast read by G4KQJ or G4IOD (The 2 Bills). Both stations do a fantastic job and can be heard from 8.30am utc on 145.525MHz, reading the National and Regional News compiled by the RSGB (Radio Society of Great Britain) live to Hams and SWLs within range. The News broadcast covers various category's from general radio news, to propagation, contests, dxpeditions and local club/rally information, lasting around 30 minutes. Afterwards the News reader QSYs to a clear frequency avoiding interference to the next scheduled neighbouring regional broadcast, where reports and any questions are invited. I call in often and did this week to the after news net, to say a quick hello, good morning and thank you, to the news reader who usually has a friendly little pile up of regulars. If you hear a Ham operator reading the news somewhere on the bands and have not yet called in to say hello and that he can be heard at your QTH, give it a go you will get a welcomed response. These guys are always there along with the rest of the net, my Sunday morning Ham radio habit is one I have learned to live with as has my YL - Louise(M3TLL). - Who now gets to sleep in all of the bed an extra hour. Since the shuffle around with my radio equipment I have been listening around the bands whilst in my usual test mode of the equipment. There's been lots to listen to lately with the many recent contests and special event stations. As usual I have managed to work some interesting as well as a few DX stations as I came across them. I am still running my motor cycle for the daily work run and unfortunately have missed opportunities to use the mobile set up. Despite the lack of mobiling I did get lucky with two QSO on 20m last week into Japan when I was out in the Toyota. The FT-100 and Maldol HF-C antenna once again gave the result I like best with good signal exchanges taking place. Earlier this evening whilst mobile, I experienced some interesting conditions where I could hear long and short skip at the same time. Signals were plentiful and at one point I heard a VK and GM 5/9, in the middle of an EU pile up that was going on at the same time(typical of course). Back in the shack almost at the end of the so called Summer sporadic openings on 2m FM & SSB, I made some great QSO as far away as the Isle of Wight and the South coast of England using the FT-2600 - Collinear and FT-847 - IOIo beam. On HF the FT-767 continues to work well with the 130 ft dipole and 20M delta loop. September has again provided good openings into S.America with DX like LU5FF, YV5ANF and PY6HD among the many other logged contacts I managed to make QSO with. With the winter nights drawing in and the cold dark mornings looming in the background, I suspect I will be increasing my radio activity both in the shack and mobile. I should have more things to blog about which will hopefully be more interesting to you guys and with a bit of luck / propagation I might even get to talk to some of you. I decided to have a change around in the shack and get some use out of some of the equipment that I had forgot about for a while. I started by installing the robust little YAESU FT-2600M – 2M FM transceiver that I have owned for just over 5 years, I set the FT-2600M up with a separate PSU and a X200 Collinear (vertical) antenna. I remembered that I had a modular to 8pin din adaptor some where in my junk draw and once I located it I connected the Adonis AMDX1 desk microphone replacing the standard fist mic. 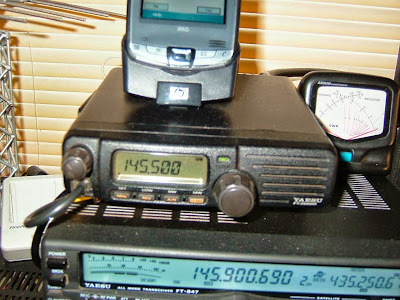 The YAESU FT-2600M rig can be seen in the image below. The next “shack adjustment” was to involve both the base and mobile setup, I have been missing the good old YAESU FT-100 out in the mobile since I supposedly upgraded to the newer FT-857. The FT-857 has been working adequately over the last 12 months but it has still failed to convince me that it is the better radio out of the two multi mode, multi band mobile rigs. The FT-857 has a much smaller display than the older FT-100 which has a nice large illuminated panel providing space for a more pleasing meter and frequency readout. The other difference which has been the main concern has been occasional intermittent poor audio reports from the FT-857 despite playing around with the various settings and menu options. The FT-100 audio reports have always been good and more often than not “excellent signal for a mobile,” which when running a QRP station it is advantageous to make the most of anything that can help make the output signal sound its best. This was instantly proved when the two radios had been swapped over as the first QSO from the newly installed mobile FT-100 was into Japan with a 5/5 report from JI1LET on 14.162 MHz, without any difficulty. I have continued making good qso throughout the week with the FT-100 mobile station when I have been using the vehicle. The FT-857 is now back in the Shack connected with a 2m wide band and a 10M vertical antenna. 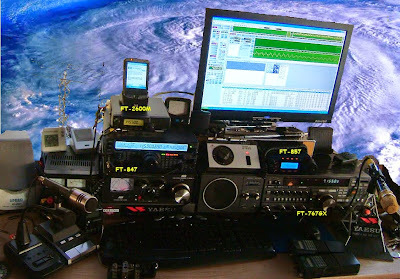 I have interfaced the FT-857 along side the FT-847 with the pc and are using the rig with Radio Com DSP decoding software for RX-ing WX Fax transmissions as well as monitoring the Air bands & WX SATs. The shack has had a dusting off and with the recent 22” monitor it is looking as good as ever ready to continue pulling in some interesting signals. At present the Worked All Europe Contest taking place on the HF Bands is providing me with plenty of stations to work as I give away a few points to some of the DX Contest Stations. I heard Indonesia earlier condx seem reasonable – Good Luck all participating. Check out the re-configured Shack setup. 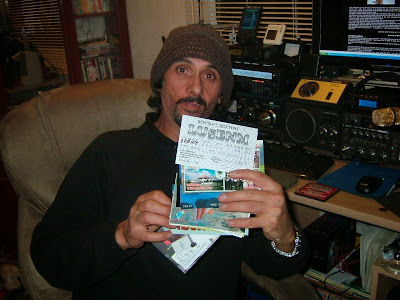 Its been exactly three years since I began blogging about all things Ham Radio here at Blogger and during the three years I have had lots of interest from fellow Hams, SWL's and Internet surfers. In fact I have made many new friends and adversaries since this humble radio blogger began ranting and raving about his radio obsession. Today's Site Meter reading was up to, Forty thousand, One hundred and twenty one visits and all I can say is Wow! Thank you, it has been and will be a pleasure for many more posts to come from Ham Radio Operator dot blog spot dot com. I have been using site meter to monitor all Internet traffic to this site which has been a valuable resource. As well as the data above and the graph below, the site meter shows the visitors location, visit duration, referral, and in/out click. Last 100 Visitors World Map Once again thanks for visiting this site.